Which tablet is best - Apple iPad or Galaxy Tab? Samsung has now officially outed the Samsung Galaxy Tab, its eagerly awaited 7-inch Android tablet. The Apple iPad incorporates a touch-sensitive IPS display that measures 9.7 inches across. It's undoubtedly a gorgeous screen, boasting a resolution of 768 x 1,024 pixels. Samsung has opted for a smaller display in the Galaxy Tab. It's still a decent size at 7 inches, which is a full 2 inches bigger than the Dell Streak tablet-phone. It gets closer to the iPad's specification with a resolution of 600 x 1,024 pixels, which looks superb on an LCD this size. Despite its size, the Apple iPad measures 242.8 x 189.7 x 13.4mm and weighs 680g (although it feels a lot lighter when you hold it in your hand). With its 7-inch display, the Galaxy Tab is obviously more compact. Samsung's quoted dimensions are 190.09 x 120.45 x 11.98mm, which makes it thinner than Apple's device. The Galaxy Tab weighs a mere 380g, which is almost half the weight of an iPad. As you'll know by now, the Apple iPad is available in two versions, one with 3G networking and one without. We'll use the basic 16GB 3G + Wi-Fi version in this example. It means that Apple's lust-object features data-only 3G/HSDPA connectivity, 802.11a/b/g/n Wi-Fi and Bluetooth 2.1 with EDR. The Galaxy Tab arguably has a better specification. It also packs 3G/HSDPA (up to 7.2Mbps), but like the Dell Streak, the Samsung tablet can be used to make phone calls (via a Bluetooth headset) and to send/receive SMS/MMS data. The addition of 802.11b/g/n Wi-Fi and Bluetooth 3.0 complete a great specification. Again, using the basic 3G + Wi-Fi iPad in this comparison, both entry-level models feature 16GB of internal memory. Of course, like Apple's iPhones, the iPad lacks any sort of expansion slot so you're stuck with 16GB if you opt for that model. If you demand more storage, you'll need to look at the 32GB or 64GB models. In contrast, you can expand the 16GB of memory in the basic Samsung Galaxy Tab (a 32GB variant will also be available). Like its Galaxy S smartphone, the Tab features a microSD slot and will support memory cards up to 32GB. This will boost the overall capacity of a 16GB model to 48GB and elevate the roominess of a 32GB Tab to 64GB. The camera in the iPad... No. Wait. There is no camera in the iPad. The Galaxy Tab, meanwhile, boasts a 3 Megapixel lens with an LED flash. In fact, it has TWO cameras. There's also an extra 1.3MP camera on the front for basic QVGA video calling. Apple claims a ten-hour battery life for its iPad, which compares to 7 hours quoted by Samsung for the Galaxy Tab. We shouldn't be surprised. The Galaxy Tab is smaller and lighter, there's less space for a meaty Li-Ion cell. In terms of performance, it's hard to separate the two. Both can rev up a 1GHz engine - the iPad is powered by Apple's own A4 chip, while the Galaxy Tab uses a ARM Cortex A8-based 'Hummingbird' processor. It also gets some extra graphical grunt from a PowerVR SGX540 core. The big difference is in the software. Apple newest updates to the already impressive iOS4 will include a new Game Center, TV rentals, iTunes Ping functionality and AirPlay wireless streaming. Apple's App Store is also a colossus, boasting an unrivalled 250,000 apps. 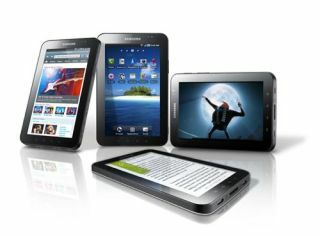 The Galaxy Tab, meanwhile, runs Android 2.2 (Froyo) and can match the iPad for multi-touch control, pinch-to-zoom and general speediness. The Android Market might have fewer apps (around 70,000+ at last count), but Android still boasts one thing that the iPad doesn't have - Flash 10.1 support. The iPad also includes A-GPS functionality (3G + Wi-Fi models only) and a built-in digital compass. It can playback H.264 video up to 720p and doubles up as a e-reader thanks to Apple's own iBooks app and downloadable Kindle software. Prices start at £429 for the 16GB Wi-Fi only model, rising to £699 for the full-whack 64GB Wi-Fi + 3G variant. Ouch. As for the new Galaxy Tab, it will come with built-in gyroscopic and geo-magnetic sensors, plus A-GPS or even full-blown GPS - Samsung's press release is vague on the details. It has its own iBooks rival too in the shape of 'Readers Hub', which has access to 2 million books, over 2,500 magazines and more than 1,600 newspapers. Samsung has yet to reveal pricing details, which will probably be set by the mobile carriers who sell it. While the iPad is still the most desirable tablet computer available, the Galaxy Tab will provide some stiff competition. Especially if it's sold at a sub-£300 price point. Samsung's device can't match the iPad for screen loveliness or battery life. But it steps up the technology battle by including a built-in camera and expandable memory. With Android rapidly improving and Samsung currently producing some of the best mobile hardware on the planet, the prospects for the Galaxy Tab look bright. As ever, seeing the new device, holding it, surfing the web and watching videos on it will be key.